Your vehicle’s transmission relies on transmission fluid to perform all its functions properly. For this reason it is important that the transmission fluid you choose is high quality and the right type for your vehicle. We looked at the 15 of the most popular transmission fluids on the market for friction coefficients, performance, reliability, cost, viscosity, and customer reviews. The three products reviewed below topped the list in all these categories. They are excellent choices and examples of the kind of high quality ATF that you want to use in your vehicle. Transmission fluid does need to be changed periodically although it is not necessary to do it as often as you would have your oil changed. It’s extremely important that you use the right transmission fluid for your vehicle or the transmission could be seriously damaged. There are a few things you need to take into consideration when you are choosing the right transmission fluid for your vehicle. Ensuring that you are using the right type of transmission fluid will help your car or truck run smoothly and will extend the life of your transmission as well. This guide will provide you with the information you need to sort through the different types of ATF that is on the market so you make the right choice for your vehicle. Along with this informative guide, we have also provided you with three of the top rated transmission fluids available. These three brands are popular with vehicle owners due to their high performance and reliability. 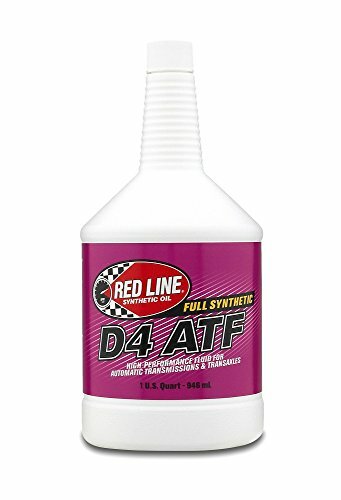 If you want an ATF that provides your vehicle with excellent shiftability at low temperatures and gives you improved thermal stability you want to get Red Line Synthetic ATF. Not only do they give you the low temperature quality shifting you want. It allows for high temperature operating as well. You won’t have any varnishing of the clutches or valves when using Red Line. This varnishing can cause transmission failure so it is important protection that you will have. It is available in 1 quart and 1 gallon sizes. Red Line ATF provides a much lower cold temperature viscosity which means better performance when shifting. Your shifting will be more consistent and smoother even over extended drain intervals. Red Line provides far better stability when it is compared to its petroleum counterparts. Give your car or truck superior protection from varnishing and extend the life of your transmission and purchase Red Line Automatic Transmission Fluid. Royal Purple is a well known and trusted brand in the automotive industry. Their ATF has the same high quality and performance that other Royal Purple products have. This high performing transmission fluid provides a lot of benefits to your vehicle. It is completely compatible with other fluids so mixing it with others will cause any problems for your transmission. You will have the best results by draining the current ATF or flushing it and replacing with all Royal Purple Max. It is designed to extend the life of your transmission by ensuring several things. 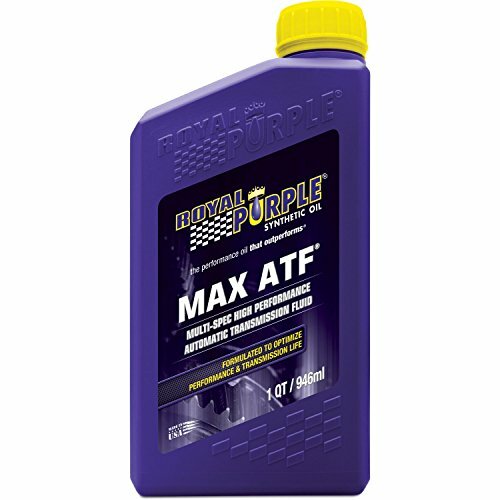 One of the most common things that Royal Purple users report is that their vehicles have better gas mileage, increased power and crisper shifting when using Royal Purple Max ATF. In addition, this premium fluid is more oxidation stable than other AT fluids which means loner intervals between transmission fluid changes. Heat and wear is reduced thanks to its low co-efficient of friction and the high film strength as well. Transmissions can generate a ton of heat. Using Royal Purple reduces this heat and keeps the transmission running smoothly for a long time. Over 90% of all transmission failures come from overheating so the 20% reduction in heat that Royal Purple Max ATF provides makes a huge difference in the life of your vehicle’s transmission. If you own a Honda, you will want to take a look at this transmission fluid that is designed specifically for Hondas. It meets all Honda quality standards and ensures smoother shifting of the vehicle regardless of whether it’s at high or low temperatures. This fluid is the OEM fluid that your Honda came with originally. 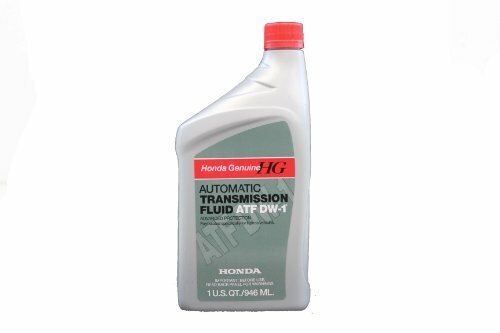 One of the benefits to using a genuine Honda ATF is that you take the guesswork out of which transmission fluid to buy and you have the peace of mind that it will perform the way it is designed t o. This fluid has low oxidation rates which means you can go longer between transmission fluid changes. It protects all your vehicle’s seals and O-rings thanks to the formula and special ingredients that it contains. It is available in 1 quart size. Choosing an OEM Honda transmission fluid might be a little more expensive than using a different brand, but you will be assured that you will get the best quality and performance from that transmission fluid that will be perfect for your Honda transmission. Choosing the right ATF for your vehicle does a lot for your transmission. It provides lubrication, cooling, prevents oxidation, helps fluid pressure, conditions the gaskets, provides anti-rust protection and much more. Using the wrong ATF can cause significant damage to your transmission and may result in failure. The three top rated transmission fluids reviewed above are all excellent examples of high quality ATFs. Any one of them makes a great choice for providing your vehicle’s transmission with the protection and high performance you want. Selecting the right ATF can be complicated if you don’t know what to look for. To learn more about automatic transmission fluids read the buyer’s guide we have provided below. This information will help you sort through the large array of choices and make an informed decision that will give you the performance and protection that will give your transmission the longest life possible. With all of the ATF choices on the market, it can be difficult to know which one is suitable for your vehicle. OEM transmission fluids provide vehicle owners with more reassurance since they are licensed for specific vehicles and have been manufactured to meet the standards of the automobile company. One of the worst mistakes a vehicle owner can make is to choose an ATF based on cost alone. Looking for the cheapest ATF that you can find can result in problems with your transmission. Depending on the ATF you are looking at, you will find that they have different friction coefficients, different additives and specific viscosities as well. They are not all the same nor are they all good quality. You also need to be careful about your selections if your vehicle is under warranty. Using an ATF that has not been approved by the manufacturer of the vehicle can result in the warranty being voided. If an ATF you are considering seems to be suitable for tons of vehicles, you should be wary. An automatic transmission fluid that is “good for all vehicles” is most often a version of Dextron III or Mercon. You will need to check the product data sheet of the ATF you are considering if it is a multi vehicle fluid. Unless your vehicle was delivered new with Mercon, Mercon V or Dextron III (or earlier) using this type of ATF can be harmful. Don’t risk using a multi-vehicle ATF unless you know for certain that Dextron III or Mercon is suitable for your vehicle’s transmission. One of the most fail safe ways to ensure getting the right automatic transmission fluid for your vehicle is to look in the owner’s manual. If you don’t have it in the vehicle, you can find the owner’s manual online. This manual will tell you exactly the type of ATF to use on your vehicle. Using this information will ensure the best results from your transmission. There are a few things that you will want to watch out for when it comes to your transmission. One of the warning signs that something is wrong is the “pink stink” which is an odor that smells burnt. This odor indicates that there may be something going wrong inside your automatic transmission. If this odor is present it would benefit you to get your vehicle looked at for potential problems. It could be something very simple but if left unchecked it could turn into something much worse. You can also see that there may be a problem by checking the transmission fluid. You are looking for a discolored brown appearance and the presence of an odor that may smell like burnt toast. If this is what you see, it means the transmission fluid has cooked itself. It cannot provide the proper lubrication your transmission needs. This burnt toast look and smell could mean truly bad news for your transmission, so it is preferable that you never get to that point. Heat Can be a Problem – One of the biggest concerns that you will want to watch out for when it comes to your ATF is heat. There is a lot of friction that is generated from your transmission and heat is a direct result of this friction. One of the functions of a high quality ATF is reducing this heat and improving the friction coefficients so the vehicle’s transmission doesn’t overheat. Have the wrong type of ATF in your transmission or having a substandard quality fluid can result in transmission disaster. The majority of ATFs on the market can handle normal operating temperatures that are in the 200 degree range. They can do this for thousands of miles. If the transmission fluid temperature rises above 200 degrees the ATF will break down and that when problems can and will occur. If the fluid reaches 300 degrees or above, the fluid life goes from tens of thousands into the hundreds. If it reaches over 400 degrees, the transmission fluid can self destruct and become a major problem for your transmission in as little as 20 minutes. Protective Additives – Your ATF is formulated with ingredients that help its oxidation stability. It also has or should have additives that prevent corrosion and reduce foaming. When ATF has been in the transmission too long, it can start to break down and causing the viscosity to change as well as affecting the lubrication properties of the fluid. This can cause operating problems and transmission failure as well. The recommended changing schedule is to change the fluid and filter every 24,000 to 36,000 miles OR every 2 to 3 years if you do not put this much mileage on your vehicle. If you use your vehicle for towing or heavy service use, get the fluid and filter changed every 15,000 miles or once a year. There are a few things you can do to stay on top of the ATF health of your vehicle. These things are simple to do and don’t require a technical knowledge of the vehicle or its transmission. Checking the Fluid< - You will want to check the fluid level of your ATF. You want to be sure that the amount of transmission fluid that is in your vehicle registers between FULL and ADD on the dipstick. If your ATF is low you may notice that the vehicle doesn’t shift as smoothly, may slip or engage on a slower basis. On the flip side, if there is too much fluid in the reservoir, it can become mixed with air and cause noise, shifting issues and slippage as well. You will need to check the transmission fluid when the vehicle is idling and in Park. It is also beneficial to put the vehicle through each gear before you check everything, as this will give the most accurate reading. When the vehicle and transmission are operating properly, no transmission fluid is used. If you check the levels and they are low, that indicates that there is a leak someone. You can also look at the pan gasket and seals for the drive shaft and see if there is any transmission fluid on them. Fluid Oxidation – One of the easiest ways to check oxidation is to sniff but the best way to check this is with a blotter test. Put some ATF (just a few drops is fine) on a paper towel and wait 30 seconds. You are looking for changes in the spot. If it spreads out and is red or pink in color, you’re in good shape. If the spot remains the same as when you dropped it onto the paper towel and remains brown, you should have the ATF changed because it has oxidized. Coolant Contamination – If your transmission fluid is more of a milky brown color, that indicates that there is cooler contamination of some kind and/or there is a leak in the oil cooler. What this leak means is that the coolant mixes with the ATF. This is not a good thing at all and should be fixed immediately. Bubbling or foaminess indicates that there is too much ATF in the vehicle. Using the wrong type of ATF or a transmission vent that is plugged can also cause this foaming or bubbling. With the important functions that ATFs have, you can see why it is so important to make sure that you choose the right one for your vehicle that is high quality and that provides the protection it needs. The information in this buyer’s guide, along with the three top rated reviews that we have provided above are designed to help you make that choice that will provide you with the optimum performance and protection. So many vehicle problems are preventable with the right products and preventative maintenance. Follow the tips and information in this guide and you will be able to extend the life of your transmission and improve the performance of your transmission as well.